How do Gardens Impact our Health? Gardens often serve as a green oasis in urban areas. They provide rest and recreation for gardeners and passersby. Food gardens supply fresh, healthy fruits, vegetables, and herbs. We know that gardens directly impact our health, but how? Numerous studies prove that the health benefits related to visiting, viewing and playing in “green settings” have a positive impact on children and adults. Studies have shown that the presence of green space is linked to benefits such as recovery from mental fatigue, stress reduction, neighborhood social cohesion, reductions in crime, violence, and aggression, reduced morbidity in multiple disease categories, and better self-reported health. Green spaces have also been linked to leading health issues such as obesity, cardiovascular health, heat-related illness, and psychological health. Gardens are a type of green space in which these benefits can multiply. Gardens have the potential to be favorite natural settings, whether in schools, hospitals, or neighborhoods. Favorite natural settings have been found to regulate negative feelings and coping with perceived stress. Visiting nearby natural favorite places leads to alleviation of negative feelings associated with recent health symptoms. Interacting with nature in various ways, such as taking walks, improves cognitive functioning and direction-oriented abilities, supporting the need to create accessible pathways to gardens. One study found that walkable green spaces positively influence the longevity of senior citizens in urban residential environments. Gardens can serve as an ideal walkable public space not only for senior citizens but also other urban dwellers and schoolchildren. Views of nature can also have restorative effects. In one study, unobstructed views of nature in hospital patient bedrooms led to improvements in self-reported physical and mental health. Studies show that patients assigned to rooms with windows looking out onto a natural setting had shorter postoperative hospital stays, received fewer negative evaluative comments in nurses’ notes, and took fewer potent painkillers than other patients in similar rooms with windows facing a brick building wall. In general, views of nature have been proven to have more positive influences on emotional and physiological states, and the benefits of viewing vegetation may be greatest for individuals experiencing stress or anxiety. Gardens and green settings have a meaningful impact on children. Studies have found that children with ADHD who play regularly in green play settings have milder symptoms than children who play in build outdoor and indoor settings. Children and youth living in greener neighborhoods have lower BMI scores. School food gardens, in particular, lead to increased openness to, preference for, and intake of fruits and vegetables. The research drives home the importance of making gardens interactive, open, and welcoming spaces for children and adults. In Austin, the Dell Children’s Hospital has created such a space through its Healing Garden. The garden serves the children, family, and staff that walk through the hospital’s doors. 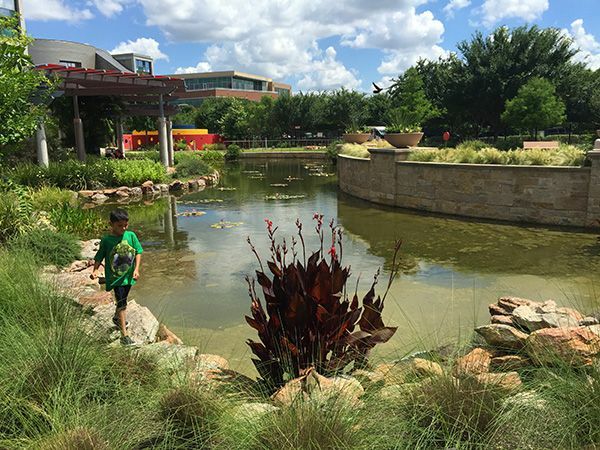 In a recent event organized by the Children in Nature Collaborative of Austin (CiNCA), a panel of staff from Dell Children’s discussed the far-reaching impact of this garden. The hospital’s chaplain, Krista Gregory, spoke about the value of connecting to nature and how many of the children who are regular patients return to their favorite place in the garden – such as a tree or a rock – because it brings joy and comfort. For some infants who spend the first weeks or months of their life inside hospital walls, the garden is where they first experience sunshine, rain, and wind. For their parents, having a quiet place outside of the hospital provides much-needed rest from the stress and anguish of having a sick child. The Healing Garden also includes a food garden where children can learn about healthy fruits and vegetables and taste the harvest. The staff has encouraged both families and other employees to consider the garden an extension of the hospital and to use it regularly. We admire the commitment of Dell Children’s Hospital to providing a beautiful Healing Garden, and we encourage other hospitals, schools, and institutions to create welcoming, interactive gardens where the physical and mental health benefits of green spaces can abound. 1. Beyer, K.M.M., Kaltenbach, A., Szabo, A., Bogar, S., Nieto, F.J., and Malecki, K.M. (2014). Exposure to neighborhood green space and mental health: Evidence from the survey of the health of Wisconsin. International Journal of Environmental Research and Public Health, 11, 3453-3472. 2. Jennings, V., and Gaither, C.J. (2015). Approaching environmental health disparities and green spaces: An ecosystem services perspective. International Journal of Environmental Research and Public Health, 12, 1952-1968. 3. Korpela, K.M. and Ylen, M. (2007). Perceived health is associated with visiting natural favourite places in the vicinity. Health & Place, 13, 138-151. 4. Berman, M. G., Jonides, J., and Kaplan, J. (2008). The cognitive benefits of interacting with nature. Psychological Science, 19, 1207-1212. 5. Takano, T., Nakamura, K., and Watanabe, M. Urban residential environments and senior citizens’ longevity in megacity areas: The importance of walkable green spaces. Journal of Epidemiol Community Health, 56, 913-918. 6. Ranaas, R. K., Patil, G.G., and Hartig, T. (2012). Health benefits of a view of nature through the window: a quasi-experimental study of patients in a residential rehabilitation center. Clinical Rehabilitation, 26, 21-32. 7. Ulrich, R. S. (1984). Views through a window may influence recovery from surgery. Science, 224, 402-421. 8. Ulrich, R.S. (1986). Human responses to vegetation and landscapes. Landscape and Urban Planning, 13, 29-44. 9. Taylor, A. F. and Kuo, F.E.M. (2011). Could exposure to everyday green spaces help treat ADHD? Evidence from children’s play settings. Applied Psychology: Health and Well-being, 3, 281-303. 11. Robinson-O’Brien, R., Story, M., & Heim, S. (2009). Impact of garden-based youth nutrition intervention programs: a review. Journal of the American Dietetic Association, 109, 273-280.